A lot of homes in today’s age boast open floor plans, which means certain rooms share a certain space. The most popular are undoubtedly the open plan living- and dining room (and sometimes the kitchen also comes into play), even though these are two very opposite spaces. The living room is where we relax with a friend or a good book, while the dining room is where we host that spectacular dinner party—or which can also serve as the home office space. To further differentiate these two spaces, they both require unique furniture pieces. With a snug sofa, television and coffee table on the one side, and a dining table, comfortable chairs and perhaps a sideboard on the other side, the two rooms exude their own unique personalities. 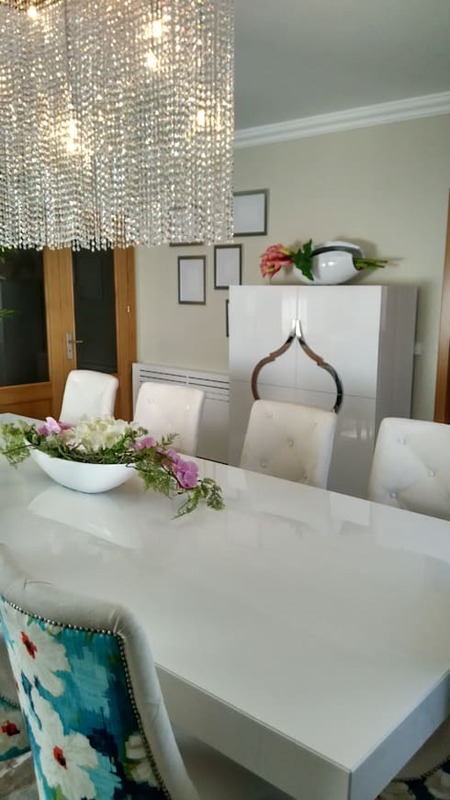 Whether you find your living- and dining rooms sharing a space or not, we are sure that you also want your surroundings to striking and gorgeous. Today we will focus on adding that certain je ne sais quoi to our dining room, and ensuring that it becomes quite the eye-catcher for our guests when they drop by. Art, whether in the form of an oil painting or a wooden sculpture, is a prime choice to inject style, colour and personality into a room. Of course we understand that not everybody can afford a Van Gogh (the good news is that nobody expects us to), but this is no excuse for a lack of art. Beautiful works of art are available at numerous stores for a variety of prices. And we are spoiled for choice when it comes to choosing a style to reflect our room’s tone. Each art object has the capacity to transform a room into a beautiful space. Each painting tells a story, and each sculpture conveys a meaning. These are also the perfect dialogue enhancers if you’re ever faced with a silent break in the conversation around the dinner table. Whether it is a colour or a decorative object, you need an element (or more than one) that will lend personality to the dining space (and might even serve as a conversation starter). Focus on something that will stand out and distinguish itself from the rest of the room. This will differ depending on people’s styles and personalities. See our example above: the warm tones (a subtle blend between autumn orange and candy red) clearly jump out from the cool hues which dominate the room. But they’re also few and far, which enhances their eye-catching effect all the more. Certainly not a drab dining room without these elements, but definitely a more striking one when including them! Let’s face it: furniture is expensive. Unfortunately, we cannot hit the stores and redo our houses every time the trend changes. For that reason, our furniture not only needs to reflect our personalities and styles, but must also “fit in” with what is currently considered “hot”. No problem, then. 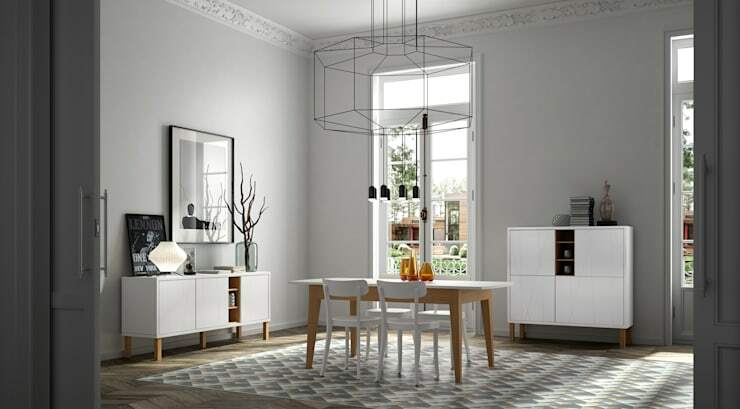 Opt for pieces that can be considered timeless: neutral and simple lines are the golden words here. This way, it will be easier (and more cost-effective) to ensure your room stays in style by simply adjusting the surroundings (colour, wall decor, accessories, etc.) every now and again. 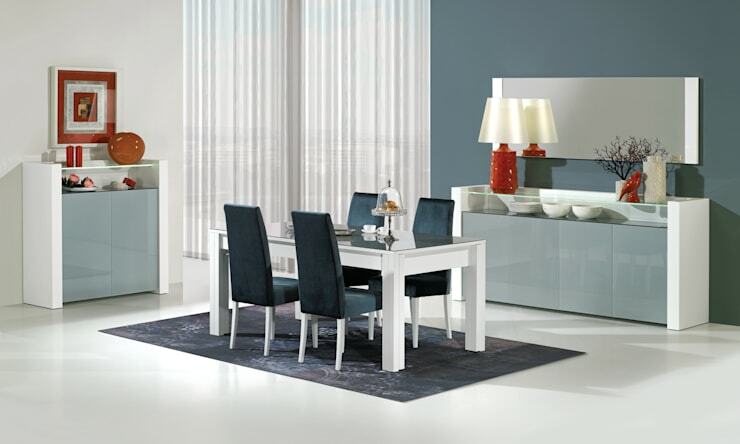 Therefore, the simpler your dining furniture, the easier it is to enhance the rest of the dining room. Lighting is a fundamental element in any house. Not only does it provide the necessary illumination, but it also adds some style and colour. And of course it’s vital to the dining room, unless you want your guests to guess what you’re serving for dinner. 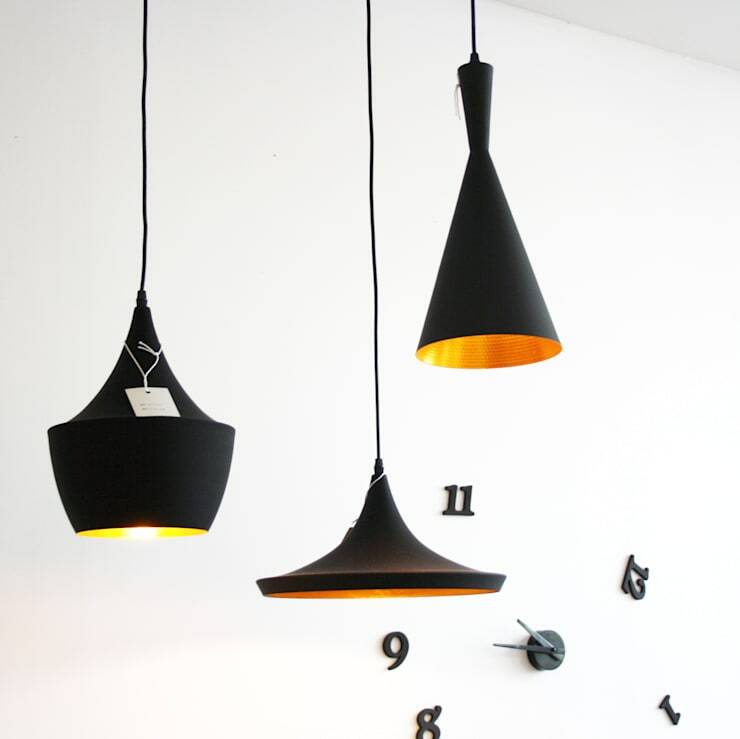 But adding lighting to your dining room doesn’t have to be just an ordinary ceiling lamp. Enhanced lighting fixtures will result in enhanced cosiness, but bear in mind not to overdo it. 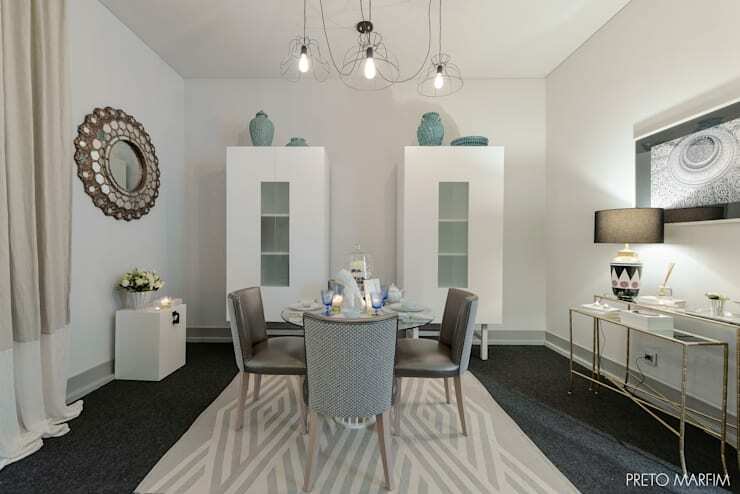 In addition to a ceiling lamp, why not opt for a table- or floor lamp. This will surely enhance the decor of the room and result in a harmonious and attractive environment. A carpet or rug is certainly very soft on the eye – and feet. It injects comfort and delicacy into any room, and when merging with the surrounding décor (or standing out from it), it can certainly provide for a noticeable effect. A lot of people would state that a rug is purely meant for underneath the coffee table in the living room; however, this is a matter of preference. What could be more pleasant than feeling the soft cosiness of the rug under your feet while enjoying that delicious meal with good friends at the dining table? But bear in mind that there is a certain art in choosing the correct rug for the correct room. To help steer you in the right direction, see our homify-approved tips on how to: Inject Some Cool Into Your Room With A Rug. And for the icing on the cake that defines personal touch, we end with decorative accessories for the dining table. Even if you’re a devout disciple of ‘less is more’, please don’t leave your dining room table completely bare – it always needs to be adorned with some colour and pattern, whether it comes in the form of food or decor. A vase with some colourful flowers is always a popular choice, or some candles. How about stones and shells for a nautical theme? Whatever décor you decide on, and whether or not you prefer it to blend in or offset with the rest of the room, make sure it’s not too overpowering. See our ingenious example, perfectly orchestrated by interior designer Andreia Louraço – simple, clean and colourful. Now, go forth and inject some style into your dining room! Did we miss anything? 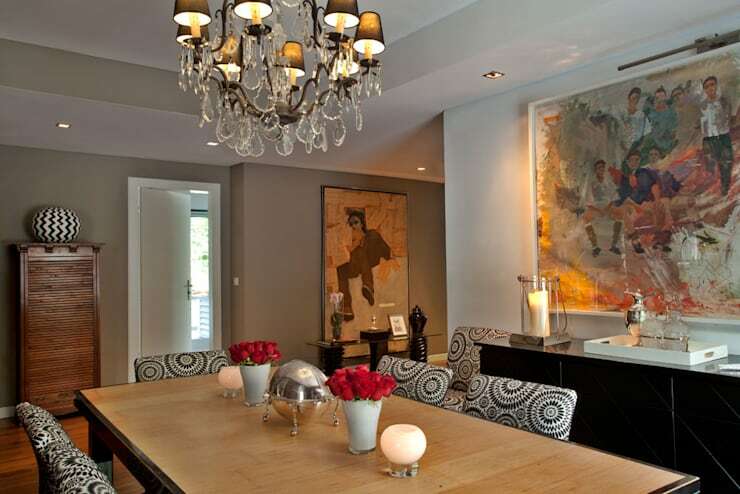 Are there any other tips you can add for creating a stylish dining room? Let us know!